Glebe Rangers travelled to Wakehurst in the league on Saturday and following the previous week’s loss to bottom of the table Portstewart, boss Jason Wilmont was hoping his side would bounce back to winning ways. Things didn’t quite go the Ballymoney side’s way as they found themselves 2-1 down with minutes remaining and also reduced to 10 men, yet again. However, a late strike salvaged a share of the spoils for the Glebe and they currently sit mid table with 11 points. 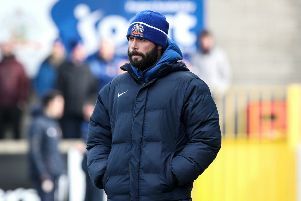 Speaking after Saturday’s game, Manager Jason Wilmont commented: “We were 2-1 down with ten minutes to go and 10 men so getting a point out of it was better than nothing. “Wakehurst worked hard but they just hit the ball from back to front to try and pick up the second ball. The first 12 minutes we were so comfortable and created two or three really good chances and then they scored on 13 minutes. We were playing good football and passing it well. Big Chris (Fullerton) got his hand on the ball, our left back calls for the ball and instead of throwing it to him, he throws it against one of their players and he knocked it in to an empty net. It was unbelievable, that put us on the back foot straight away. “They created a few chances and so did we but we went in at half time a goal down. I tore strips of them in the dressing room, I told them we were ten times the team they are. We started the second half and scored a really good goal in the first minute to make it one each. We were the better team by a mile, we had all the play although we only created a few wee chances.